A pretty pink butterfly comes to rest on an elegant glass vase and remains there - a thing of beauty now and forever. 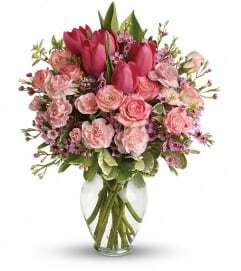 If you're looking for a truly unforgettable floral gift for someone special, you've found it. 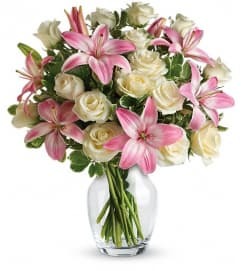 The radiant arrangement includes white alstroemeria, light pink roses, hot pink spray roses, Sweet William and miniature hot pink carnations accented with Queen Anne's Lace. 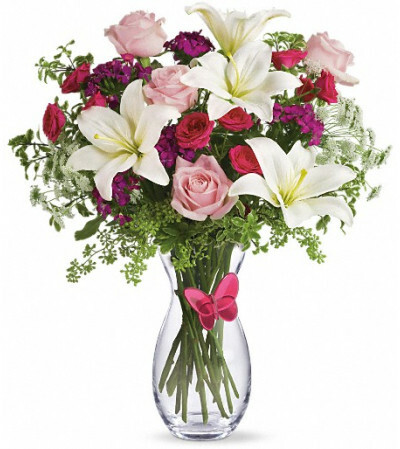 Delivered in a sparkling glass vase decorated with a sculpted pink butterfly.